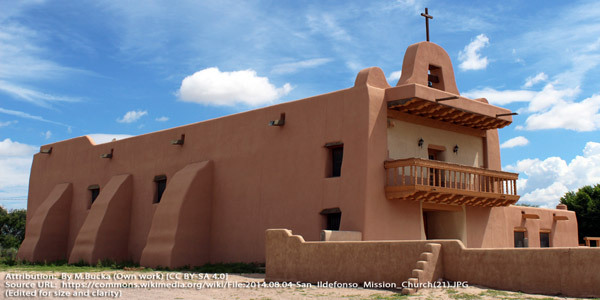 The San Ildefonso Pueblo is situated north of Santa Fe and is home to about 1,700 residents. The most striking physical feature of the pueblo is Black Mesa. The Rio Grande River cuts though the pueblo, providing plenty of water for irrigation. This is a Tewa-speaking pueblo, which had a history of growing corn and beans. They stored their harvest in pots covered with rawhide. There are several archeological sites on the pueblo, which has been occupied since about 1300AD. The Spanish attacked the pueblo in 1694 and the tribe sought refuge on top of Black Mesa, where they successfully repelled the Spanish advance. Eventually, the tribe surrendered, and the pueblo population was decimated by disease. By 1864 there were only 161 pueblo members left. A smallpox outbreak in 1918 took the population below 100. This Pueblo is unique in that it has vigas, or columned porches. Today there is a nearby dam that supplies irrigation water to grow corn, beans, squash, and chilies. Many of these items can be seen drying on lines in the back yards of people's homes.